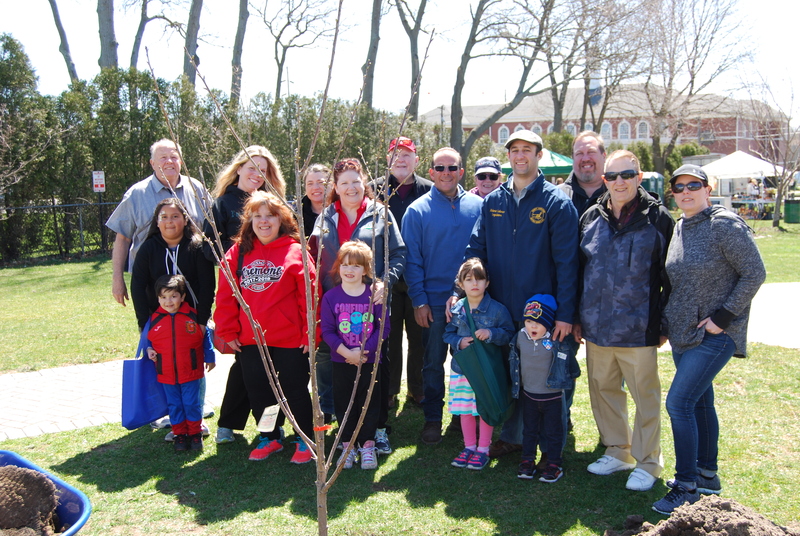 Jonathan Abrams (front row, center), Manager, Gershow Recycling Corp., is joined by Robert Calarco (front row, third from right), Suffolk County Legislator, his two children, Alma Rosa and Patrick Calarco, members of the Medford Civic Association and local vendors at the Medford Earth Day event at Medford Memorial Park on Saturday, April 21. Also pictured (front row, l-r) Cathy LoSchiavo, Member, Medford Civic Association; Linda Tobin Davis, President, Medford Chamber of Commerce; Bill Bernstein, Medford resident; and Bunnie Schiller, Event Organizer and Member, Medford Civic Association. Back row (l-r): Don Seubert, Vice President, Medford Civic Association; Erinkelly Connell and Danielle Paisley, Director, Patchogue-Medford Library; Paul Donoghue, Member, Medford Chamber of Commerce; Martha Mikkelson, Librarian, Patchogue-Medford Library; and Tex Dennerheim, Member, Medford Chamber of Commerce. Gershow Recycling was the main sponsor and participant in the Medford Earth Day event, which took place at Medford Memorial Park on Saturday, April 21. Gershow representatives were on hand to give out coloring books, newsletters and reusable tote bags. Gershow donated $650 to sponsor the event. The funds benefited the Medford Civic Association — one of the event’s co-hosts — and will be used for additional beautification projects in the community. The event was also hosted by the Office of Suffolk County Legislator Rob Calarco, the Medford Chamber of Commerce, the Medford Fire Department and the Office of Brookhaven Town Councilman Neil Foley. Since 1970, Earth Day has been celebrated to address growing concerns about the environment and how it can be protected.